The clean scent of pine fills the air as we begin our hike to Chester Lake. A steady climb up for 40 minutes has my heart pounding. I wonder why my head feels a familiar dizziness. Ah, the altitude, that's it. Haven't felt that since leaving the Andes mountains years ago. We stop to catch our breath several times. Those are good opportunities to turn and look back over the valley to the snow-covered peaks beyond. A pair of chipmunks scurries in a clearing. We reach a snow-covered meadow. A few summer blooms peek out through the white and our boots crunch on the trail. A young Spruce Grouse hides behind a tree while his mother stands guard closer to the trail. She doesn't move and I get several photos. Canada's National Parks are amazing places. We enjoy today the foresight of past decisions to keep these areas free of development. The other hike we enjoyed was a short one to Grassi Lakes, where the water is the beautiful colour you see in the photo above. 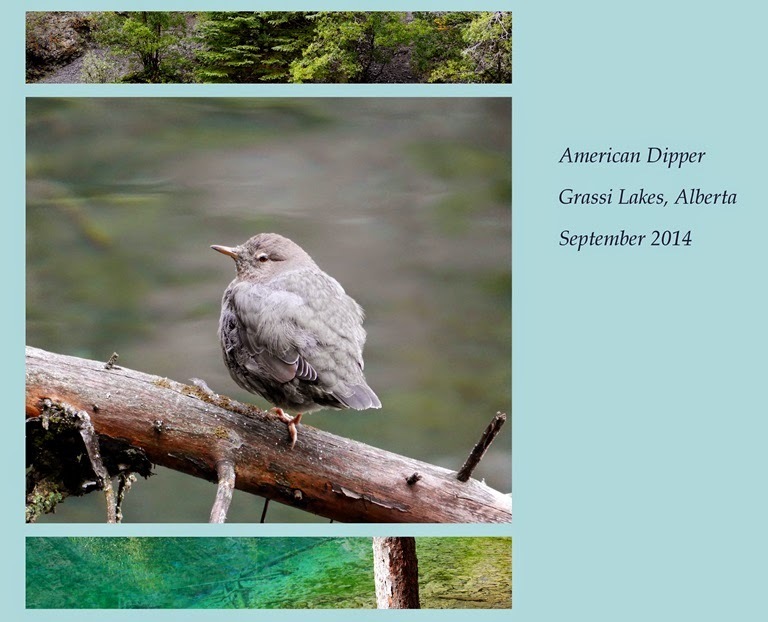 An American Dipper perches on a branch over the water, eyeing us carefully, but content to pose, turning this way and that. We're home again now. The grass is cut, laundry is swishing, and everything unpacked. I picked 15 pounds of tomatoes and will begin canning/salsa/freezing once again. There are green beans, raspberries, kale and zucchini. Our lovely trip is a memory, kept in our minds to be brought out at will. Oh, and there's a little residual stiffness in my upper legs from the climb. Joining with Mosaic Monday, hosted by Judith of Lavender Cottage Gardening. Oh Gosh, the water in the lake is so clear. Love those deep green and blue colors. Canada's nature is breathtakingly beautiful. Such beauty captured so well in your photos. Love the little bird! Just stunning photos! I love the one of the beautiful, clear, green water. Wonderful memories for you both. Enjoy the week ahead. It sounds like you'll be busy 'putting up' for winter. The water is so clear and the color so pretty. Lovely images. Looks like fun! Happy Mosaic Monday. Both you and Pat have shared a hike upwards this week and I have to admire your stamina. I also admire the scenery and birds you saw. Such gorgeous photos, Lorrie! You saw such beauty and documented it so well! Lorrie I share you love for National Parks and the beauty of the wilderness! 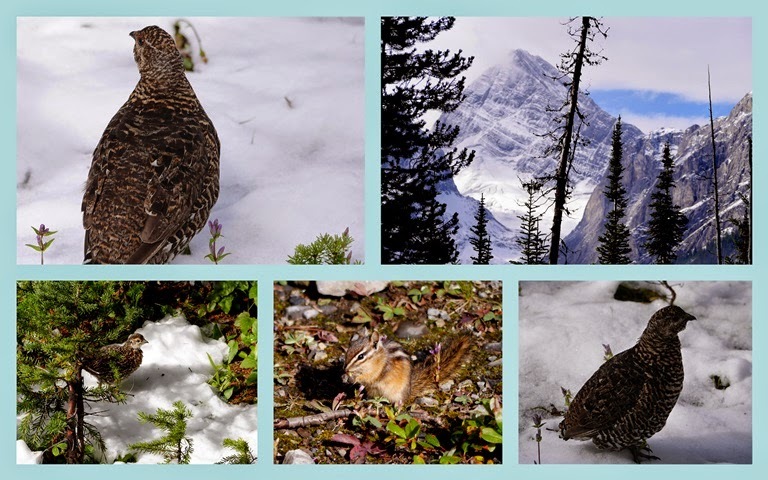 Seeing the Spruce Grouse. I see your mountain tops also have snow on them --the one we climbed is now closed to the public for the season as the snows have arrived. Stunning scenery of Canada's gorgeous landscape and waters! Lorrie, I can't believe the snow! How invigorating it must feel to have completed such a hike - surely re-energized for all those awaiting chores! The color of the water is amazing!! Lorrie, what a beautiful place to hike, to roam, to explore...and that water. Wildlife, and turquoise water? Beautiful. Your photos are beautiful Lorrie, we do live in paradise! You made me recall my college summers spent as a camp counselor and hiking the tallest mountain in southern California multiple times on 4 day hikes. Oh my goodness, what a spectacular place. That water! I enjoyed these photos so much. And I love so much what you said "Our lovely trip is a memory, kept in our minds to be brought out at will." Wow...that blue/green water is so beautiful! That water is beautiful, and I loved the mama grouse. The scenery is spectacular. Best wishes with all the canning. Will be nice come winter. If it is ok, may I make copy of the picture of water to use as inspiration for my jewelry...? I have a file I put all my inspirations in...I only use them for colors..
Ah, back to reality, huh? That blue green color of the water is spectacular. I adore the national parks of Canada. It is amazing to think about the grand sights I have seen in your great country. I hope to have a few more trips up there in the years ahead! How lovely! I would be so excited to see those birds and that lake water is totally amazing and so clear. What a beautiful hike! Your photos made beautiful mosaics. It's so nice to get out in the great outdoors and enjoy the beauty. It's a work out, too! Enjoy your week! Hugs! Such beauty. Well worth the breathless walk. I cannot believe how green the lake is. Stunningly beautiful. You do have your cut out for you. I may go out and pull up all of the pepper plants and harvest the peppers. I'd like to make jalapeno jelly. Your are industrious. Have a great week. Breathtaking photos, Lorrie! I so miss traipsing through the woods, but my mobility and stability are not what they used to be. Gorgeous photos and beautiful collages! I am totally in awe at the beauty. What an AMAZING Creator God we serve! Your photo did a great job of capturing the unique colour of the lake. I'll never forget seeing it for the first time many years ago - couldn't quite believe that it was for real! Oh my, that is really enticing to me. I would love to visit such a place right now. It would be a welcome change. It's all really beautiful. I'm envious! We didn't manage to get out for a single hike this summer -- such a good way to stay fit and to put one's fitness to very good use! And your photos are wonderful, as always. Just lovely especially that blue green clear water...I love that image...cute little bird reminds me of a wren. Sometimes arriving home to the mundane is harder than being away, don't you think? There's always so much to do after one unpacks to get back to normal! That's an amazing veggie harvest Lorrie, and raspberries too - lucky you! Glad you had such a fabulous trip - it looked perfect.